Well it is finally here. Please visit the site – jenniethepotter. There’s still a few minor issues to resolve and more content to add but it is definitely ready for the world. I also will have an ad in the upcoming knitty. It should be up soon and perhaps I’ll have some folks who wander to the site from there. Yeah! Besides all the hoo hah that goes along with getting a site up I have been preparing for some upcoming shows. This year we’ve decided to have only two weekends of our holiday shows. (In past years we have had sales every weekend from Thanksgiving to Christmas eve.) We take all the furniture out of our front rooms and turn our little house into a gallery. 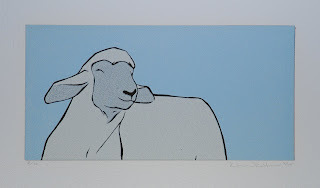 This year our friend Karen will be returning with her lovely prints. I wish I could have a Karen print in every room – truth be told I almost do. Aren’t they lovely? Also I have been asked to return to Kathy Pususta’s holiday open house at her farm in East Bethel, MN. She has revamped her old barn and created a boutique to show off her soaps, lotions, and of course her wonderful yarn. Her farm is wonderful – llamas, sheep and chickens. She also dyes for Blue Sky Alpaca’s so there sure to be some lovely skeins of that. My knitting friends from the Northwoods retreat will be there as well, no doubt sporting their newest crafty creations. I wonder if I can get all my holiday shopping done in one day? I’m excited to spend a whole day catching up with friends and perhaps getting some knitting done too! If you are so inclined please stop by! This entry was posted in Uncategorized on December 3, 2006 by Jennie.